Surjit Kumar Jyani, Fazilka along with Pathankot was given district status on July 27 last year. The city's main junctions were decorated like Diwali had come three months early. Sukhbir, who presided over a function organised to mark the occasion at the MR College Stadium, laid the foundation stone of the Rs. 37-crore district administrative complex (DAC), besides inaugurating a Rs. 59-lakh computerised revenue record centre at Fazilka, a Rs. 3.15-crore 66KV power grid station at village Theh Qalandar and a Rs. 2-crore high-level bridge over Jalalabad main drain at Ladhuka. He also announced the setting up of a 100-bed hospital costing Rs. 22 crore at Jalalabad at the earliest, and promised construction of a building for the Government Senior Secondary School for Boys too. He said that being a border area, the development of Fazilka district would always remain on the top of the agenda of the state government. In reply to a query, Sukhbir pointed out that due to deficit of rainfall in the state, the state government has already urged the union government to release Rs. 800 crore for providing relief to the farming community, which was "forced to bleed to save the paddy crop". Forest minister Jyani, Ferozepur MP Sher Singh Ghubaya, Amritsar MP Navjot Singh Sidhu, state BJP president Ashwani Sharma and deputy commissioner Basant Garg were among those present on the occasion. Last month, Pakistan participated in a meeting of the railway authorities of the Economic Cooperation Organisation countries in Ankara. The ensuing discussions and resulting press release have made it evident that the original Registered Community Design member countries, Pakistan, Iran and Turkey, plan to bolster their rail links in the coming few months, with the Islamabad-Istanbul cargo service to be hopefully recommenced shortly. Pakistan's business community participated wholeheartedly in the meeting; with a clear mandate that in order to elicit interest from the private sector, the service needed to be regular and punctual. I believe that from the point of view of Pakistan, there were two very significant outcomes from this meeting. Firstly, the meeting illustrated the resolve at both the government and private levels to develop rail transport within the ECO block as a viable form of transport, which also reflects the present government's prioritisation of better trade linkages with Central Asia and the Greater Middle East region, so to say. This is a most certainly a positive development, given both the saturation and financial turmoil currently facing Pakistan in its more traditional markets in the West. Secondly, the meeting made Pakistan even more painfully aware of its poor state of rail infrastructure. Indeed, the participants noted that the current running time of the Gül Train, which is a cargo train connecting Islamabad with Istanbul via Tehran, was the longest in Pakistan (10 days). This has extended the train's total running time to an unattractive 18 days (4 days each in Iran and Turkey). Pakistan was asked to curtail the running time the train spent while traversing its territory. However, there is an elephant in the room, which no one appears to notice. With all the talk about enhancing trade with India over the past one-and-a-half years, our policymakers are surprisingly lethargic when it comes to the issue of improving Pakistan's rail connectivity with India, located in our immediate neighbourhood. While the spillover effects from this would be enormous (think about the teeming hundreds who use the dilapidated rail wagons to visit their loved ones and holy sites in both the countries every year), let us talk about this proposal from a pure business point of view. The existing setup: At present, two provinces of Pakistan's territory with rail networks share borders with India: Sindh and Punjab. The Thar Express plies the tracks linking Sindh with Rajasthan. Besides being a service that is marred by severe delays and inefficiency, the tragedy is that it is utterly useless to businessmen. No cargo trains are allowed on this route, even though a considerable amount was spent by the Government on widening the track gauge prior to the reopening of the route in 2006. Opening up this route would greatly serve the interests of businesses based in Sindh, which trade with Maharashtra and Gujarat, and are presently using the Mumbai-Karachi sea route. The business community has asserted that this route will save considerable money now being paid as ocean freight to shipping lines, which take almost ten days for loading and unloading; while trains would allow cargo to reach dry ports within a period of 24 hours at much lower handling cost. For instance, according to a 2006 study supported by the World Bank, it costs $550 to ship a 20 ft container from Mumbai to Karachi. On the other hand, a comparable container sent through the Delhi-Wagah route costs an Indian trader just $325. The distance between Delhi and Wagah (approximately 500 kilometres) is roughly comparable to that between Khokrapar and Ahmadabad (Gujarat). Therefore, we could assume a similar cost involved in using this route for container trains; a clear cost advantage to the business community of both the countries. The other route, linking the two Punjabs, is of greater use to the business community of both countries in its present state. This is true despite the fact that there are frequent complaints about severe shortages of rolling stock, warehousing facilities, corruption, and general inefficiency at this border. But it is encouraging to hear that over the past one year, both countries have been involved in efforts to revamp the existing setup for trucks at Wagah-Attari, which should alleviate the situation somewhat, by easing the burden on the rail route. According to a study by Indian think-tank ASSOCHAM, the improved border crossing is expected to help bring trade to $8 billion annually, from the existing level of $2.6 billion. Potential for improvement: While there is obviously plentiful room for improvement in the two routes mentioned above, let us explore the possibility of further rail linkages between India and Pakistan. Jaisalmer district in Rajasthan is the terminus of a broad gauge track of Indian Railways, which joins with the main system at Jodhpur. Jaisalmer is highly connected to the rest of India by air, road and rail. It is situated 217 km from Pakistan's major rail station Rohri, which is less than the distance between Karachi and Rohri (478 kms). Jaisalmer earns a large share of its income from tourism. On the other hand, Rajasthan state itself is rich in minerals, agricultural produce and industry. In particular, the establishment of a further link between Sindh and Rajasthan would serve the interests of the farming community on both sides, and help in dealing with shortages of food in times of famine and drought, which this region is susceptible to. Another rail linkage, which could perhaps be explored with Rajasthan is with Anupgarh, which is located right on the border of Rajasthan, and is bounded on the west by Bahawalnagar district of the Pakistani Punjab, and on the north by East Punjab. Anupgarh is the hub of Rajasthan's food grain industry, and is one of the terminals for India's North Western Railway Service. To provide some perspective, keep in mind that Anupgarh is located no more than 200 kms from Multan. If we were to move outside of Rajasthan to East Punjab, we would notice that there are some railway terminals that could almost readily be of use to us besides the Wagah-Attari terminus. Consider for instance Firozpur, which is serves as a Railway Divisional Headquarters for Indian Railways, and has easy access by road and rail to other cities such as Amritsar, Ludhiana, Jullundur, Delhi, and Chandigarh. Incidentally, until 1970, the Ganda Singh Wala-Hussainiwala route, which opens into Firozpur district of India, functioned as a conduit for the trade of fruits and food products between Pakistan and India. There is also a disused railway track, which presumably used to connect the two countries. In 2005, there were proposals to reopen the border; while there has also been indication of interest from Pakistan's business community to open this border during the recent thaw in Indo-Pak ties, but it remains closed to date (This crossing is just located at a drive of 45 minutes from Lahore). History also tells us that there is another previously used route, which can be reinvigorated with some effort. The Indian rail terminal of Fazilka was connected by rail tracks to Mandi Sadiqganj on the route to Bahawalnagar, and then to Bahawalpur. The distance between Fazilka and Mandi Sadiqganj is approximately 150 kms. Before partition of the subcontinent, this rail line was of great importance for connecting Delhi with Karachi via Bhatinda. It may be kept in mind that Bhatinda is one of the largest railway junctions in India, with no less than six rail routes extending from it. Major industries in Bhatinda include fertilizers, energy petrochemicals, textiles, citrus fruits and sugar. All of these should be of interest to Pakistani industrialists. In particular, according to the Hindustan Petroleum Corporation the Bhatinda oil refinery could become an important gateway to Pakistan for the supply of petroleum products from India and potentially naphtha from Pakistan, if relations between the two neighbors improve further in coming times. In this scenario, then, a working rail link between Bhatinda and Pakistan would be of great benefit to Pakistan. Finally, I would like to identify Malout, which is located at a distance of only 45 kms from Pakistan, and used to lie on the erstwhile Bhatinda-Karachi line. Malout is famous in India for its agricultural equipment manufacturing industry; an area in which Pakistan is quite weak. Another major industry in the region is related to high cotton cultivation in the region. Since the past few years, cotton-related business has been booming in the region. It is worth mentioning here that the market for second-hand cars and two-wheelers in Malout has also grown to become one of the biggest in the region. All of these represent potential opportunities for Pakistan. In conclusion, Pakistan stands much to gain from better rail connectivity with India, if we go by the rail terminals that I have identified above. If we look at the broader picture, India already maintains vigorous rail links with Bangladesh and Nepal, is working on building a track to Myanmar, and is studying the possibility of linkage with China. Conversely, Pakistan seems to lag far behind in this respect despite of the available endless opportunities; some of which have been highlighted above. In this regard, the private sector in Pakistan must step forward, given the present difficulties being faced by Pakistan Railways, and assume a leading role, because they are the ones who stand to gain the most. FEROZEPUR: In a first-of-its kind exercise, the state police have joined hands with rickshaw operators to provide them free road safety education and training. In response to the request of Graduates' Welfare Association, Fazilka, (GWAF), the state additional director general of police (traffic) has asked all police commissioners and SSPs to impart free road safety education and training to all rickshaw operators and their unions. "It's a welcome move by the state police," said GWAF secretary general Navdeep Asija. The inclusion of people - who are at the bottom of the development pyramid but play important role as service providers and also safeguard environment - in the road safety programme would help bridge the gap between common man and governance, he added.Initially, Project Ecocabs was designed for the welfare of rickshaw pullers and to improve overall quality of cycle rickshaw service in Fazilka. The project is operational since June 20, 2008. On April 28, 2010, the high court took suo motu notice of media reports on 'Fazilka Ecocab' and directed Punjab, Haryana governments and Chandigarh administration to implement the same concept across the two states and UT. On HC directions, the project was being made operational in more than 22 cities of Punjab. There were about three lakh cycles rickshaws operational in various cities and towns of Punjab. Every day, each rickshaw saves approximately 3 litre of fuel and 45.6 kg of fresh air, which is required to burn that fuel. Besides providing safeguard from pollution/exhaust gases, rickshaws generate jobs. "Cycle rickshaw operations in Punjab save about 9 lakh litre of fuel and 1.37 crore kg of fresh air per day. It also provides direct and indirect employment to more than 3.5 lakh poor families across the state. Cycle rickshaws cover almost 90 lakh km and transport more than 60 lakh passengers every day," said Asija. With number of motor vehicles increasing on Indian roads, road safety had also become a major cause concern. About 5.5 crore commuter trips are undertaken in Punjab every day, 60 lakh trips of which are solely being covered by cycle rickshaws. The Punjab road crash data for 2010 indicates that among three lakh rickshaws, only two fatal accidents were reported. In both cases, rickshaws were at the receiving end. On the other hand, five lakh cars were responsible for more than 1,500 fatalities. The comparison shows that cycle rickshaws have emerged as a most sustainable mode of transportation in the state as well the country. "It's the need of the hour to have 'Vision Zero', which implies that no death on roads," said GWAF patron Bhupinder Singh. To achieve this goal, the help of the state traffic police was sought because it keep on organising traffic awareness programmes, he said. Hindustan Times. Page 2, Chandigarh Edition. The district administration is yet to take up the road safety measures as 58 precious lives have been lost in road accidents in the district from October 2011 to June 2012. The administration has reportedly failed to complete the proceedings to constitute a district-level road safety council even as an year has passed since Fazilka was declared a district. District Transport Officer Gurtej Singh says, "The copy of notification of the council is yet to be obtained from transport authorities." He admitted that the ex-officio members have not been included in the committee so far. 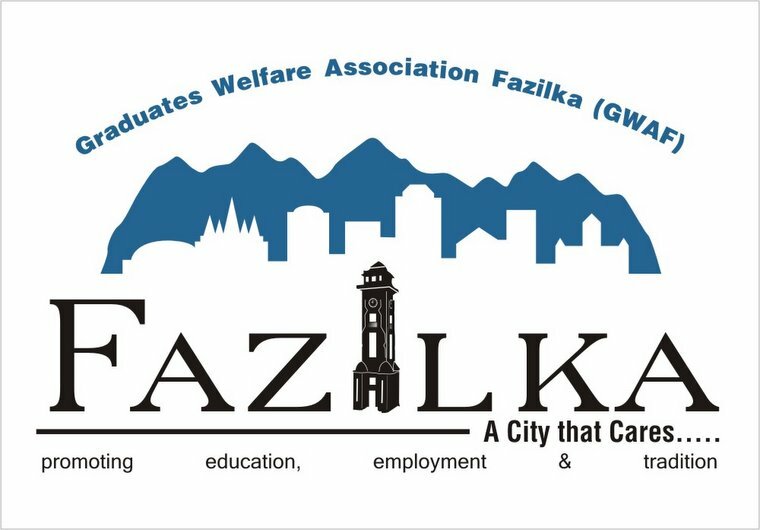 The Graduate Welfare Association, Fazilka, has obtained information in this regard. As per the information released by the Punjab Police, there are about 400 accident black spots in Punjab out of which 14 fall in Fazilka district. Those in Fazilka district have been identified at Balluana (Abohar-Malout Road), Alamgarh (Abohar-Sriganganagar Road), Hanumangarh bypass chowk (Abohar), Seetogunno bypass (Abohar), New Hanuman Mandir Tikoni (Fazilka), T-point (Near Malout Chowk Fazilka), Sanjeev Cinema Chowk (Fazilka), Khuai Khera (Near Fazilka Co-operative Sugar Mills), Jalalabad bus stand, Arianwala Chowk (Jalalabad), Shaheed Bhagat Singh Chowk (Jalalabad), Tiwana Mour (Jalalabad), Nimwala Chowk (Jalalabad) and village Ghubaya in Jalalabad. "Nothing much in terms of engineering interventions, removal of encroachments in black spot areas has been done in order to improve road safety," said Navdeep Asija, technical advisor and member of the governing council, Punjab State Transportation Society. Traffic management does not seem to be the priority of the district administration. As per official sources, in the last six months (Jan 2012-June 2012) the traffic police have issued challans to only 4,666 in Fazilka district. Interestingly, no challan was issued for drunken driving while only 34 persons were penalised for overspeeding. The district police is not equipped with electronic gadgets like alcometer and speed guns to curb drunken driving and overspeeding. "We have been frequently issuing challans to the drivers jumping the red light and have removed black films from the glasses of vehicles. Besides, traffic awareness seminars are also organised in schools and colleges twice a week," claimed District Traffic In-charge, inspector Gurpiar Singh. ISLAMABAD: The 85th birth anniversary of the 'King of Ghazal', Mehdi Hassan was observed across the country on Wednesday. Mehdi Hassan was born on July 18, 1927 in a village called Luna in Rajasthan, India, in a family of traditional musicians. He had claimed to be the 16th generation of hereditary musicians hailing from the Kalawant clan of musicians. Mehdi Hassan had his musical grooming from his father, Ustad Azeem Khan, and uncle Ustad Ismail Khan, who were both traditional dhrupad singers. Hassan started to perform at a young age and his first concert of dhrupad and kheyal with his elder brother is reported to have been held in Fazilka Bungla, near present DC House, of Undivided Punjab. After the partition of India, the 20-year-old Hassan and his family migrated to Pakistan and suffered severe financial hardships. Hassan initially started working in Chichawatni, in a bicycle shop. He later became a car and diesel tractor mechanic. Despite the financial hardships, his passion for music did not wither and he kept up the routine of practice on a daily basis. In 1957, Mehdi Hassan was given the opportunity to sing on Radio Pakistan, primarily as a thumri singer, which earned him recognition within the musical fraternity. He had a passion for Urdu poetry, and therefore, he began to experiment by singing ghazals on a part-time basis. He once cited radio officers ZA Bukhari and Rafiq Anwar as additional influences in his progression as a ghazal singer. His very first super-hit song was "Jis Ne Mere Dil Ko Dard Diya" (film Susral) in 1962. Gradually, he became one of the most popular ghazal singers in Pakistan and the neighbouring India. A very old dream of the people of Abohar and Fazilka will be fulfilled on Monday. Minister of state for railways KH Muniappa is coming to Abohar to open a train route between the town and its new district headquarters. Naresh Chand Goyal, divisional railway manager, Ferozepur, has confirmed the schedule. On Wednesday and Thursday, in a precursor to opening the train service, a high-level team led by commissioner of railway safety (CRS) Raj Kumar inspected the new track. In February 2011, the-then railway minister Mamata Banerjee proposed in the rail budget to run a passenger train between Fazilka and Abohar. This February, railway minister Dinesh Trivedi (who has since quit), in his rail budget, proposed to run the Ferozepur-Sriganganagar Express via Fazilka and Abohar. Abohar and Fazilka, 42-km apart, have no rail link for decades. In February 2004, the-then railway minister, Nitish Kumar, had laid the foundation stone of one and agreed to open it by 2007. Delay completion has shot up the cost to Rs. 210 crore from the original Rs. 88 crore. The physical work, including the building of platforms en route, was over long ago and even teams were deployed at the new stations between Fazilka and Abohar. Only the train, the main requirement, had not been made operational. The rail link will not only boost trade on the country's entire western border but also give a swift mode of transport to the army. "The business activity in Abohar and Fazilka will pick up," said Vikram Sharma, a businessman of Abohar. "Right now, it is dormant." "Defence forces need new trains in the region," said captain MS Bedi (retired) of Fazilka. Representatives of the Abohar chapter of the India Against Corruption citizens' movement of social activist Anna Hazare had been on hunger strike at their town to demand the train service to Fazilka. The relay fast continued for more than 60 days, and on Sunday, the participants were still on strike. "We won't cease our agitation until we see the train running on the ground," said Ashok Garg of India Against Corruption. "In papers, it's running since July 1." Minister of State for Railways KH Muniyappa is likely to inaugurate the Abohar-Fazilka rail link at a function here on July 16. Northern Railways manager VK Gupta will accompany him in a special train from New Delhi. Railways officials today ran a special train on the track for a final inspection. Former MP Virendra Kataria said he had talked to Railway Minister Mukul Roy over the phone regarding the inauguration. The Abohar-Fazilka rail link will pave the way for linking the two remotely located cantonments at Udhampur (J&K) and Jaisalmer (Rajasthan). Kataria had moved a proposal in the Rajya Sabha to connect Abohar and Fazilka by rail in 1994. The proposal was okayed by the Planning Commission in 1995. It took almost two decades for the project to become a reality. ABOHAR: The Fazilka-Abohar rail link is likely to become operational soon as a team led by the commissioner of railway safety (CRS) will be visiting Abohar and Fazilka on July 11 to give final clearance to the 42-km track. Foundation stone for the track was laid on February 1, 2004, at the Fazilka railway station by the then railway minister Nitish Kumar, and the project was to be completed by March 2007 at a cost of Rs 84.44 crore. However, a hefty sum of Rs 214.80 crore, about two-and-half times more than the initial cost, has already been spent on the track. As of now, all the four railway stations on this route are ready. The staff has been posted and trains to run on Bathinda-Abohar-Fazilka route were included in the railway time-table in July 2011. But ever since, trains on this section have run only in the time-table. "We are keeping our fingers crossed and hoping that the CSR will visit Abohar and Fazilka track to conduct the final inspection this time. The government has already suffered huge financial losses to the tune of several lakhs due to trains not being run on this completed track," said Amar Lal Baghla, president of Northern Railway Passengers Samiti. He says the running of trains on the track will offer a direct link to the Jammu region and Gujarat when it becomes operational. If preparations being made by the railway authorities are any indication, it seems the rail track is likely to become operational shortly. Sources in the department informed that the CSR, S C Matkal, is expected to arrive at Abohar on Wednesday morning. He will inspect the track and the railway stations as well. Sources added that the train service is likely to be inaugurated by the Union minister of state for railways K Muniyappa shortly. ये रिक्शा वाले चार कदम और आगे..
CHANDIGARH: The Punjab and Haryana high court has directed the Chandigarh administration to file an affidavit informing about the steps taken for the revival of rickshaw stands in all sectors of the city. Directions came from a special division bench comprising justice Surya Kant and justice Ajay Tewari during the resumed hearing of a case pertaining to the introduction of eco-friendly rickshaws and designating the vehicle-free zones in Punjab, Haryana and UT Chandigarh. The bench told UT senior standing counsel Sanjay Kaushal that use of non-polluting vehicles was the need of the hour, and unless there was pro-active approach from the authorities concerned, there would be no results. The bench also said that earlier there were sanctioned rickshaw stands in the city but at present, hardly any such stand could be seen. During the hearing, amicus curiae (friend of court) advocate Rita Kohli submitted that founder of eco- cab service Navdeep Asija was ready to introduce at least 10 such ecocabs in the city, if the administration supported him. On this, Kaushal apprised the bench that Asija had already been requested by the administration to park eco-cabs in Sector 17. Kohli also told the court that there was poor response from the Haryana government on introduction of eco- cabs. However, the Punjab government informed that it was going to convene a meeting on July 10 over the issue. The court also directed Haryana and Punjab to file their replies during the next hearing on July 17. "In the last ten years, a sum of Rs. 151 crore was allocated to Punjab for rural sanitation. But Punjab could take only Rs. 29 crore. (Therefore) before you blame somebody else, look within," Ramesh said talking to reporters here today when he was asked to respond on the state government's charge of discrimination by the Centre. Asserting there was no discrimination against Punjab, he said, the Centre always stressed upon providing funds to the states which are in need of development projects. Ramesh said that he was asked by Prime Minister Manhohan Singh to make provision for rural road projects in the border districts of Punjab. "I talked to the PM a few days ago and he told me to propose something for the border districts of Punjab, including Gurdaspur, Amritsar, Tarn Taran, Fazilka, Ferozepur and Pathankot, under the Prime Minister Grameen Sadak Yojna. We will come up with a project in the next 3-4 months for these districts," he said. He further said that on the request of Punjab government, a team of Planning Commission visited the waterlogged areas of the state to find a solution to this problem as about five lakh acres of land was found to be water-logged. "We have even asked Punjab government to come up with a proposal for a 1700 km rural road project," he said. A sum of Rs. 7.5 crore has been sanctioned for setting up a bridge in a village in Fazilka under PM Grameen Sadak Yojna. "Punjab government has no reason to complain about discrimination by the Centre," he asserted. SAD-BJP led Punjab government on many occasions had accused the Centre of meting out "step-motherly" treatment to the state on the issue of creation of storage space, funds allocation, etc. फाजिल्का पहुंची 'रेलगाड़ी नंबर 420'! Gurmail Singh Rajpal and Ajmer Singh, farmers in Sikhwala village in Muktsar, have not cultivated their land for years. Water logging problems have caused their lands to become barren. They are now working in the fields of others to make both their ends meet. The same problem afflicts Ajay Nagpal in Fazilka, whose 3 acre land has also been lying vacant for years. Nagpal has had to give up farming and is now working in the private sector to earn his living. Rajpal, Singh and Nagpal are not alone. Thousands of acres of land in the Malwa belt are facing water logging problems. In areas like Muktsar, Bhatinda, Fazilka and Ferozepur, farmers are either surviving on bank loans or have changed their profession. The worst off are working as farm labour in other's fields. In order to gain first hand knowledge of the problems of these farmers, a 10-member team from New Delhi will be visiting various districts of the Malwa belt on July 2. The team intends to submit its report by the last week of November this year. Later, the Centre may sanction funds for finding solutions to this problem. The team will be headed by Mihir Shah, Member, Water Resources and Rural Development. Sikhwala is the worst affected village in Chief Minister Parkash Singh Badal's constituency Lambi. 35 other villages around this area are also equally affected, according to information received from the Agriculture Department. DC of Fazilka, Dr Basant Garg, said "In Punjab, Fazilka has the maximum water logged area and it is 12,000 acres in total. So the team will be interacting with the farmers even in this area as well." Some progressive farmers in Fazilka have already launched a project to start a food park there, and to revive water logged land. The team is likely to suggest solutions to the farmers, besides making a project report about the actual problem in the entire belt. In a reply submitted to the Punjab and Haryana high court on Sunday, not long after chief minister Parkash Singh had inaugurated the "Greener Punjab" campaign at Fazilka, the department stated that the threatened Badha lake area of Fazilka was not in its purview, but area along the Alam Shah minor was protected forest indeed. "If protected forest area is required for the colony, PUDA (Punjab Urban Planning and Development Authority) will need due approval of the forest department," the affidavit stated, making no comment on the biodiversity of the Fazilka region or that more than 400 exotic tress were on the verge of being cut in the Badha wetland area. Social activist Navdeep Asija of Fazilka had filed a writ petition in the Punjab and Haryana high court, opposing a residential colony that PUDA had proposed on the wetland site. Even the high court had ordered status quo on the sub judice matter, PUDA, in February, auctioned 56 residential plots on the land. The state government had acquired the wetland area under "optimum use of vacant government land" policy. The Badha wetland is in an eco-sensitive zone. The Punjab state science and technology council had accepted a report that recommended every possible action to save wetlands. PUDA had no permission from the forest and wildlife department or the state pollution control board for the project at Badha. In 1844, British East India Company officer Patrick Vans Agnew had chosen the banks of the Badha wetland to found the city of Fazilka. He was so inspired by the flora and fauna of the lake that he made his first bungalow in India near the wetland's banks. Till the 1980s, the lake was the main source of drinking water for Fazilka town. Mankind's greed choked the natural flow of river Sutlej that used to recharge the lake with fresh water every year. Revenue record filed in the high court in a previous hearing suggested that from 1977 to 1995, panchayats of the villages nearby made revenue out of fish farming over the lake. In 11 of the past 16 years, legislators from Fazilka and Jalalabad were forest minister, yet the region had the lowest forest cover in the state. The current affidavit only accentuates the regime's double standards. "The Rs-80-crore Greener Punjab campaign is a waste of money for political mileage," social worker Asija said on Sunday. "It's a ploy to cover up future massive cutting of more than 3 lakh trees along the canals and roads to extends the number of lanes to four and six." If the government was out with a green campaign, it should also ensure its proper implementation, Asija added. "They are cutting grown-up trees," he said, "and planting saplings as replacement." Asija took the matter to the CM on Sunday, and and the latter instructed the forest department officials to bring all the record on the matter to Asija. The next hearing in the high court is on July 6. Punjab chief minister Parkash Singh Badal on Saturday said the SAD-BJP government had set the target of planting 40 crore saplings across the state in the next eight years with the aim of making the state clean, green and pollution-free. Presiding over a high-level meeting of the government top brass and all deputy commissioners (DCs), the CM said the state government would formally launch the 'Greening Punjab' campaign on Sunday from Fazilka for enhancing the forest cover. He said the government had set a target of planting 5 crore saplings every year, for which the DCs were required to play a proactive role to transform the campaign into a public movement. Badal asked the DCs to identify vacant government land in their respective districts for massive plantation. The chief minister asked the financial commissioner (forests) DS Bains to visit all districts to monitor the plantation drive. He said there was no dearth of funds and keeping in view the importance of greenery in the state, the Punjab government had already constituted a dedicated Greening Punjab Fund. Badal said he would regularly monitor the campaign, while asking the DCs to submit weekly reports in his office in this regard. He also asked the DCs to constitute district-level monitoring committees, apart from appointing nodal officers for the campaign so that it could be carried out in an effective manner. The chief minister reiterated that in order to help people get their routine administrative work done, the DCs must attend their offices regularly and ensure their presence on three days Tuesday, Wednesday and Thursday. Besides, Badal asked the officers to regularly tour villages under their jurisdiction to apprise themselves of the problems.